Staffordshire Oatcakes are, quite possibly, the best regional speciality you’ve never heard of. In fact, that is much more of a generalisation than you may realise, because they’re specifically regional to North Staffordshire, centering on the region around Stoke-on-Trent. It’s historic origins are mixed, with some anecdotes suggesting they originated from soldiers returning from India and trying to reproduce the chapatis they had eaten, with local produce. A more likely scenario, is as one of the various traditional ‘bakestone’ items found in workers cottages all over the country. With wheat being a valuable commodity, most people used flour from cheaper oats and barley, and with a cooking time of mere minutes, they are surprisingly sustaining. They can be eaten hot from the pan, but as with other griddle bakes such as muffins, crumpets and pikelets, they can be made in batches, and then toasted as required, making, if anything, an even speedier snack. Oatcake shops used to be small and plentiful, with sales being made through open windows. Alas, the last of this kind of shop, the Hole In The Wall in Stoke-on-Trent, closed down due to re-development of the area in 2012. Commercial producers are still churning out batches in 6s and 12s, and they are even stocked by some of the large supermarket chains, but they taste best when home-made. Obvs. These oatcakes are made mostly of oats, in the form of oat flour. If you want to hunt out some oat flour, then have at it, but I’ve found, through trial and error, that whizzing some steel-rolled oats in a spice grinder is both easier and cheaper. You could probably use a blender as well, as they too have the off-set blades necessary to chop the oats into a suitable fineness. Whatever is easiest being the main order of the day. You can use instant yeast, but I must admit, the batter made with fresh yeast always tastes better to me. I’ve read a lot of recipes and watched many a documentary clip on Staffordshire Oatcakes and I’m going to confess up front that this recipe might be viewed poorly by oatcake devotees. It makes a batter that is rather thicker than the traditional, which results in a thicker oatcake. In my defence, it makes for a more durable oatcake which I can then turn easily in the pan without it breaking, and it ‘laces’ beautifully, with the surface becoming dappled with the characteristic pockmarks and holes seen also on pikelets and crumpets. The thickness also allows for a wonderful contrast when toasted between the crisp outsides and the fluffy insides. If all this is a heresy to you, feel free to dilute the batter down to your liking after the 1-hour rise. If you have a decent non-stick pan, you can cook these fat-free. Put everything into a large bowl and whisk together with a balloon whisk. Alternatively, use a stick blender. Cover with cling film and leave in a warm place to rise. Heat a non-stick pan over medium heat. If your pan is in need of a little help, use a sparing layer of fat (bacon fat or lard) to help prevent your oatcakes from sticking. Gently stir your oatcake batter. The yeast and rising time will have turned it into a liquid with the consistency of frothy double cream. Put 1 ladle/cup of batter into the middle of your pan and tilt the pan around until the batter has spread fully. Don’t be tempted to use the back of your ladle/cup to spread the batter out, as it’s very easy to spread it too thin and either make holes in the middle, or edges so thin they begin to burn before the middle is cooked. The moisture in the batter will soon evaporate, leaving a lacy surface of holes and craters where bubbles from the batter burst. Allow the oatcake to cook until there is no moisture visible on the surface – about 2 minutes. Using a spatula or slice, loosen the edges and then the undersides of the oatcake until it is freely sliding around in the pan. Flip the oatcake over and cook for another 2 minutes or until the surface is starting to brown (see photo). When done, slide out of the pan onto a wire rack to cool. Continue until all the batter is used up. This will make a batch of about 10 sturdy oatcakes. As the oatcakes cool, they will soften and take on the appearance of a floppy pancake. Wrap in plastic and store in the fridge until required. You can put whatever you like in your oatcakes, but a filling of bacon and cheese is not only traditional but forms one of those rare, simple ingredient combinations that border the sublime. Grill your bacon or cook in a pan until beginning to caramelise. Set aside and keep warm. Take your oatcake and put into a hot, dry pan – ideally the one you originally cooked it in. An oatcake has two very different sides, the pockmarked ‘front’ and the smooth, brown ‘back’. Put the ‘back’ of the oatcake into the pan first. Allow the oatcake to heat through for 1.5-2 minutes. Sprinkle the cheese over the hot ‘back’ (which is now uppermost) of the oatcake. It will melt as the other side toasts. When the underside of the oatcake is warmed through and crisp, lay 2-3 rashers of bacon on top of the melted cheese on one half of the oatcake and fold the other half of the oatcake over (as in the photo). Slide onto a plate and enjoy with sauce, if liked. Here’s an idea I came up with for a no-mess breakfast sandwich, snack on the go – or brunch whilst lolling around on a Sunday. Soft, pillowy muffin dough is folded around a filling of your choice, and cooked on the griddle (or in my case, a heavy-duty frying pan) for just 7 minutes each side. No more worrying that your filling is going to slide out from between your muffin layers, or spill down your front. Best of all, no greasy fingers! I opted for a mixture of well-seasoned caramelised onions, chestnut mushrooms softened in butter and a feisty cheddar. It’s a combination that I’ve only recently discovered, having been rather ambivalent about mushrooms for many years, but now I’m slightly obsessed with it. The earthiness of the mushrooms, the richness of the onions and the sharp tang of cheese is seriously delicious. Chestnut mushrooms have a rich mushroomy-y flavour without the black of portobello mushrooms. You can obviously customise the filling to your own tastes. I would heartily recommend a cheese of some sort – to bind everything together in a delicious, gooey bundle. Melt 30g of butter in a heavy pan over a medium heat. Add the mushrooms, sprinkle with a little salt and cook until the mushrooms are softened and most of the liquid has evaporated. Set aside to cool. Melt the remaining butter and the oil in the pan and add the onions. Sprinkle with a little salt and stir over a medium low heat until softened and starting to brown. Season with pepper. Drain the excess oil from the onions by placing a sieve over a bowl and pouring the onions into the sieve. Leave to drain and cool. Cut the cheese into small (5mm) dice. Mix together the cheese, onions and mushrooms in equal quantities by volume. Use a cup. Any cup. You’ll have onions and mushrooms to spare. Keep the remainder in the fridge in plastic boxes to brighten up sandwiches and snacks. Tip out your risen muffin dough and divide into 100g pieces. For each piece of dough, fold the edges in towards the middle, then turn over so that the folds are underneath and the top is smooth. Cup your hand over the dough and roll it in small circles, shaping the dough into a smooth ball. When all the dough has been shaped, for each piece of dough, roll out gently to a diameter of about 10cm. Add 2tbs of filling to one half of the dough. Dampen the edge of the dough with a little water, then fold the dough over the filling. Pinch the edges together neatly to form a tight seal. Sprinkle the worktop with cornflour and set the shaped and filled dough aside to rise. By the time you’ve finished filling and shaping all of the dough, the first ones will be ready to cook. Heat a heavy bottomed pan over medium high heat until thoroughly hot. Turn the heat down to low and add in 2 or 3 of the stuffins turning them upside down as you do so. By cooking the slightly dried top first, the stuffins will retain a more muffin-y shape. Gently turn the stuffins over and cook, uncovered, for another 7 minutes. To reheat, zap in the microwave for 15-20 seconds, then toast each side for 1 minute in a dry pan. Here’s a variation of a recipe in MY BOOK – brazen, shameless plug! – which I have adapted from one of my favourite vintage recipe books, snappily entitled “Morning and Hot-Plate Goods including Scones, Buns, Teabread, etc” by John Boyd. It is a book for professional bakers, in that the recipes inside involve ingredients measured in pounds rather than ounces, but it is compact nevertheless, with a jaunty yellow cover and both line and photographic illustrations throughout. It is undated, but after a quick search of t’internet, the mid 1940s seems a good guesstimate of age. The book claims that this is the original recipe of those NORTY buns in the 18th century that caused everyone ‘taking the waters’ in Bath to put on so much weight, allegedly forcing Dr Oliver to invent the altogether much less fun Bath Oliver biscuit for people to nibble on instead. The dough is a deep, golden colour from all the butter and eggs, and dotted with crunchy sugar and orange peel. Don’t be alarmed at the quantity of nutmeg, it looks a lot, but it’s not overpowering at all – skimp on it at your peril. These buns are definitely an indulgence – a delicious, DELICIOUS indulgence, but the freezer is your friend and thus these treats can be spread over a few weeks, rather than having to consume them all in one sitting, however tempting that may be. Since my book came out, I’ve picked up a couple of snippets of additional information about Bath Buns. Despite their rich ingredients, their appearance wasn’t supposed to be a smooth, spherical ball of dough, rather they were deliberately of a rough and craggy exterior, which, I must admit, is a great contrast to their soft, luxurious interiors. The iconic sugar nib topping remains. Some recipes suggest using a pair of spoons to portion out the soft dough, but thanks to a quick flick through MANNA by Walter Banfield, I discovered an altogether easier method (see below). The recipe calls for fresh yeast – my latest fad – but feel free to substitute rapid-rise yeast if preferred. Heat some water in a small pan. Crack the eggs into a bowl and add the milk. Whisk together, then put the bowl over the simmering water and whisk until the mixture is warmed, but no hotter than blood-temperature (dip a clean finger in to test). Whisk in the yeast and 50g from the flour and set aside to rise for 30 minutes. While this is working, in another bowl, gently warm the butter over the simmering water until soft. Add the granulated sugar, nutmeg and lemon essence/zest and whisk to combine. Combine the two mixtures after the yeast has been working for 30 minutes and stir into the remaining flour. Knead well for 10 minutes. It is an extremely soft dough, but please resist the temptation to add any more flour as this would compromise the texture of the finished buns (I use a stand mixer & a dough hook). Adding the nibs and peel: Here you have a choice. You can add in 150g of the nibs at the end of the kneading, then set it to rise, OR you can add in 150g of the sugar after the first rise. Adding the sugar straight after the kneading will mean it leeches moisture from the dough and starts to dissolve as the dough rises, leading to less of a crunch in the bite of the finished bun. Add 150g of sugar nibs after the first rise, and they are still relatively large and crunchy, even after baking. The rest of the nibs will be scattered over the top of the buns, so their crunchiness needs to be factored into your decision as well. The peel can be added at either time, but I generally add it after the kneading to allow its aroma to permeate the dough. Cover the bowl with cling film and leave to rise for 1 hour. Tip out the dough and pat down. Add the sugar/peel if not already done so. Portion the dough into pieces weighing 150g. Form these pieces into neat balls, then gradually stretch the ball of dough between your hands until it pulls in half – pretty much like those diagrams of cells dividing. Place the buns with the torn side upwards onto baking sheets lined with parchment paper. In the recipe in my book, the buns were placed atop a sugar cube soaked in lemon juice. As the buns cooked, the sugar and lemon juice melted together to give a deliciously crunchy coating to the base of each bun. These buns are so rich from the butter and the sugar nibs, this isn’t necessary, however the parchment is a must to ensure they don’t stick. Whisk the egg with a little water and glaze the buns, then allow to rise for 45 minutes. Bake for 15-20 minutes, turning the tins around after 10 minutes to ensure even browning. Remove from the oven and leave on the tins. Cover the hot buns with clean tea towels to keep the crust soft as they cool. Scotch Eggs are delicious, I think we can all agree that that is fact. Alas, they are also usually deep fried, and can thus be prone to being either overcooked or dry, or greasy or, heaven forfend, all three. Something needed to be done! Behold my new creation – The Scone Egg™! 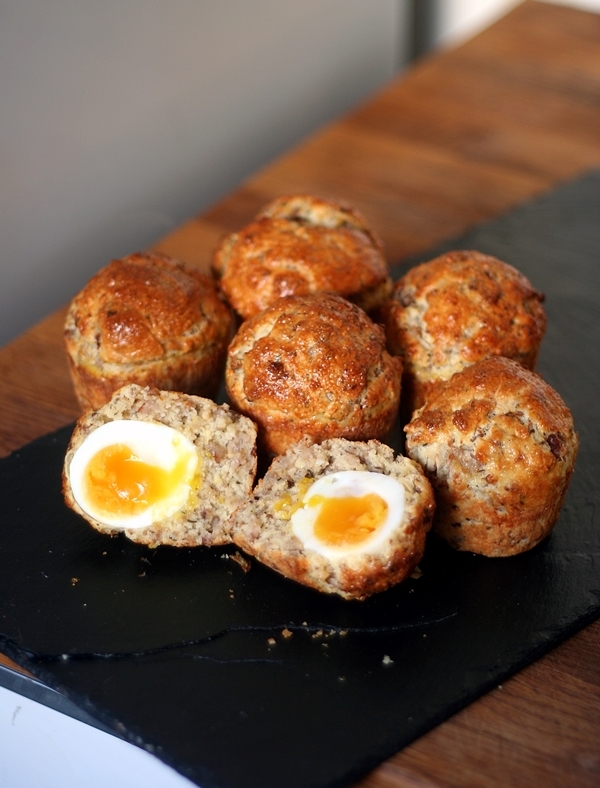 Everything you love about scones and Scotch eggs in a single, warm, comforting bundle of deliciousness! These are also a natural progression from some savoury scone variations I included in MY BOOK </subtle>. If you’ve got a copy, you will find the scone recipe on page 248. A couple of pages later, there are some suggestions for customising a basic scone recipe. The savoury scones are very popular with The Lads that look after my car, at my local garage. What started out as an attempt to combine all the deliciousness from a Breakfast Sandwich into a scone, took a bit of a detour and here we are at Scone Eggs! Soft, crumbly scone, spicy sausage, an egg that is still runny in the middle, and no deep frying! To ensure a liquid center to your egg, they should be boiled for no longer than 5 minutes. This makes them a little tricky to peel, but if you follow the instructions below, you will be blessed with a much lower egg ruination rate. Alternatively, go for hardboiled eggs and make the whole process altogether less fiddly, and which would also make them more sturdy and therefore suitable for picnics, etc. 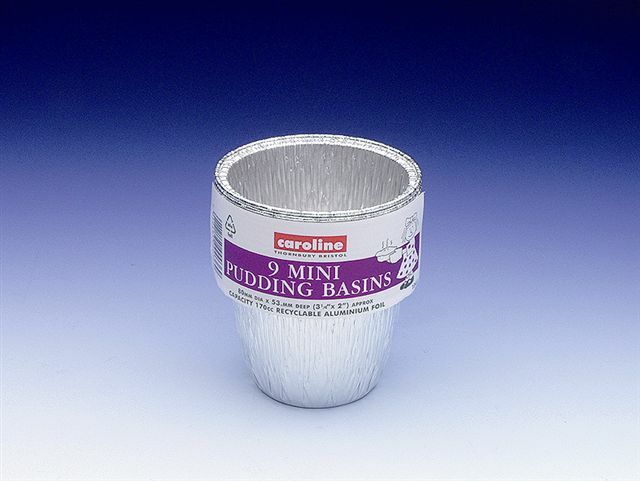 You will need some small individual pudding bowls to bake them in – I use foil ones like this – which can stand several uses with careful washing between bakes. The key to baking a light scone is, as ever, the speed with which you can get them into the oven after adding the liquid to the dry ingredients, whilst avoiding being too rough with the dough. Have everything ready – eggs boiled and cooled, foil cases oiled – and your oven at temperature before stirring in the liquid and you should be able to have them in the oven in about 5 minutes. I’ve specified more eggs, just in case there are cracks or breakages when removing the shell. In addition, depending on how thickly you wrap the scone mixture around the egg, you may get up to 6 Scone Eggs from this recipe. Or not. But you will most definitely get four. Bring a pan of water to the boil. Turn the heat down to a simmer (this will help keep the eggs from cracking). Add the eggs, gently lowering them into the water with a spoon. Allow them to cook for 5 minutes, then drain the water and cool them in cold water. The eggs will be easiest to peel once completely cold, so either add some ice or more cold water if necessary. For hardboiled eggs, cook for 10-12 minutes. Take a teaspoon and with the back of the spoon, tap around the ‘equator’ of the egg, making sure the shell breaks into small pieces. Then use the back of the spoon to break the shell around each end of the egg. With the point of a sharp knife, break away the shell from the ‘equator’ region, until you can peel both shell and skin away together, preferably still attached to one another. This is key in removing the shell smoothly and successfully. Sometimes bits of the shell will drop away leaving the skin intact. Use the point of the knife to break through until you can hold shell and skin together between your fingertips. Once you can hold both skin and shell together, peel around the middle of the egg, then peel each end. Lay the peeled egg carefully on a plate – its soft middle will mean it doesn’t hold its shape entirely, but enough until you’re ready to wrap the scone mixture around. Remove the skin from the sausages and put the meat into a frying pan over medium heat. Sprinkle with pepper, salt, herbs and spice to taste. Using a spatula, break up the sausage meat as it cooks. Continue chopping and turning the meat until cooked through. Set aside to cool. When cold, tip the cooked sausage into the bowl of a food processor and blitz very briefly to break up any large chunks. You don’t want it as fine as breadcrumbs, but at the same time no piece larger than about 1cm. Put the flour, butter, bicarbonate of soda, cream of tartar, salt and egg into the bowl of a food processor and blitz until it resembles breadcrumbs. Weigh out 200g of cooked sausage meat and add to the scone ingredients. Stir through. Whisk the milk and yogurt together. Check you’ve got everything to hand to get the scones into the oven, pudding tins greased, egg for glazing whisked, pastry brush handy, oven hot, etc. Using a rounded knife, gradually add the milk mixture, stirring the dry ingredients as you go. You might not need all of the liquid, depending on the moisture in the sausage, so proceed cautiously – you can still bake an overly moist scone mixture, but it might slip off the egg before it is fully cooked. When the mixture has come together, tip out onto a floured surface. With floured hands, roughly shape it into a circle, then divide it into quarters. Take a piece of dough and place it in the palm of your left hand. Use your thumb and fingers to shape a hole or pocket into the dough. Be careful not to press the dough too thin – it should be 1.5-2cm thick. Take one boiled egg and place it into the pocket. Mould the scone dough around the egg until it is smoothly covered. Pinch off any excess dough and put on one side. You will end up with sufficient dough to wrap another 1 or 2 eggs. Decide which end of the scone is smoothest and then drop the moulded scone into a buttered pudding tin, smooth side uppermost. When all scones are formed, brush over the tops with the beaten egg. Bake for 15 minutes, turning the baking sheet around after 10 minutes to ensure even colouring. When fully cooked, allow to firm up for 5 minutes before gently easing them out of the tins. Run a knife around the edge first, in case the glaze has caused it to stick to the tin. Set onto a wire rack to cool. You DO have a copy, don’t you!? No pressure….. I take a box of warm scones in whenever my car needs some TLC. Caveat: as long as you eat them within 30 minutes of baking – as they cool, the yolk will continue to cook and longer than half an hour and it will be solid. This list is by no means exhaustive, they are just the brands I have tasted and can vouch for personally.